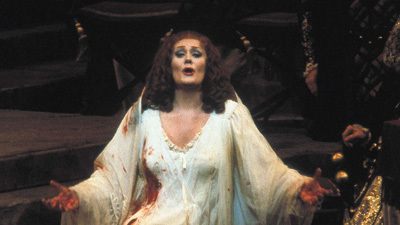 Just five years after her astounding debut in Lucia di Lammermoor, Australian soprano Joan Sutherland returned to the Met in 1966 for more thrilling performances as Donizetti’s unhinged Scottish bride. In this broadcast from December 31, 1966, the full force of La Stupenda’s vocal artistry is on display. With her husband Richard Bonynge conducting, Sutherland offered an interpretation overflowing with radiant coloratura and dramatic depth. Tenor Richard Tucker as Edgardo sings with rock-solid technique and a wealth of musicality. 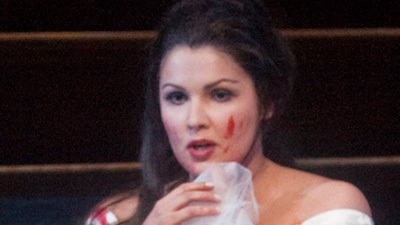 Italian baritone Anselmo Colzani brings a virile intensity to Enrico that goes hand-in-glove with the epic splendor of Sutherland’s Lucia.